This was a crazy busy week as far as crochet goes, which means it was super busy week all around. Can I tell you what I did? I hope you don't mind! I received an order for 10 crab hats last Saturday, 8 of them were adult sizes - and I was able to finish all of them by Wednesday. Update: the customer just ordered 4 more of them! I made a black earflap hat with a pink mohawk. 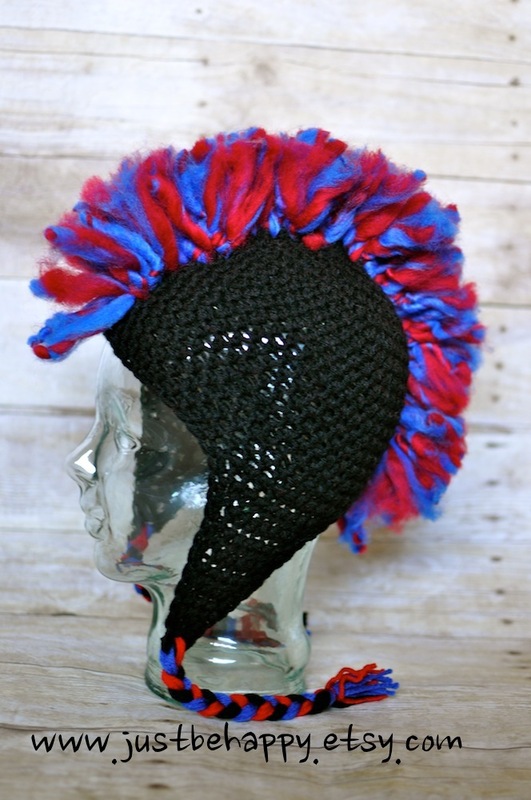 and a black earflap hat with a blue and red mohawk. and two hats for a friend that's expecting her first baby. That's what I could remember, I have a feeling that I am forgetting some, but that's for you to have an idea of how many items I crochet every week at this time of year, when I get lots of orders. 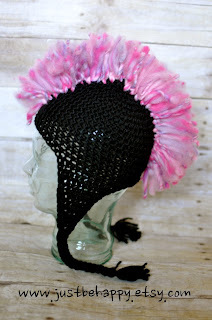 Besides crocheting, I have a husband (wonderful one, by the way) and a toddler to care for, a house that needs to be cleaned daily, laundry to do, cooking, and all the other household chores. I am also a friend, a sister and daughter. I help at my son's preschool often, I take my son to the gym twice a week, I read and play with him. I'm the designer, the crocheter, the marketer, the mailer, the contact person that replies every single message, the photographer in many cases - I'm one person business. It annoys me sometimes when I hear people saying things such as "I should find a craft to do and start selling it too". Go for it! Give it a try. People would appreciate the handmade more if they new all the work that is put into each piece made. To become successful you need much more than learning how to make a craft, you need a lot of dedication - I often go to bed late so I can have time to work on my orders and I still wake up with my boy in the morning and a lot of love - imagine yourself making 10 of those crab hats in a roll if you didn't really love to crochet? I love crocheting, LOVE and I happy I have gotten where I am, just wanted people to know that things just didn't fall from heaven, I work hard for them. Congrats on the crab hat order! Do you know what the customer is using them for? Wow! You are very talented and devoted!